In an effort to be more proactive about learning salsa, I posted a message to the local Couchsurfing group to rally some people for a night of salsa dancing in Medellin at El Eslabon Prendido in the city center. I suggested last Thursday night, but Ellen (Holland) and others responded that Tuesday nights were best, as a live band played music to a packed bar. I met Martin in Parque Periodista a half block from the bar, and we also bumped into a few couchsurfers hanging out after attending a show at Teatro Lido, in addition to a few heading for the bar. Arriving around 9 pm, and paying a 4,000 peso cover (about $1.60), we were there early enough to occupy a group of tables near the front of the bar where the band would be playing. Slowly, people began to file in and the bar filled up as the band began to set up around 10 pm. Wax candles were lit along the walls, providing an intimate ambience. Guiomar (red shirt) asked me to dance while everyone else was still sitting down and chatting. I quickly found out she was an amazing dancer – one of the two best I’ve had the pleasure to learn from. Unfortunately, she didn’t speak much English, which added some humor to her attempts to instruct me verbally. As the band began to play, more and more people got up to dance. I was really enjoying the whole atmosphere. I danced with several people including Ellen, Jesusa, and an Australian girl. The three and a half hours I was there went by too quick. By 12:30 am, I was relegated to the sidelines, too tired to keep dancing but not quite ready to leave the bar as the band had begun a second set. It was fun to watch the most skilled dancers go at it. It only motivated me to want to get better, faster. My plan was to ask for Guiomar’s help in that respect. I hope to find a few people wanting to go out to El Eslabon Prendido every Tuesday, which would give me the chance to immediately practice the new moves I learn in my dance classes. Salsaaaaaaaaaa que rica!! !Que grupo tan bueno el de ese día. The Eslabon Prendido is one the best places to go to dance, to listen to music and watch the match of your favorite team. in my opinion i recommend you to go the Eslabon Prendido on Thursday because the party is crossover and you can dance until 4pm. in conclusion i think that is difficult take a decision to go to Medellin because it has some places wonderful,magic and its women are beautiful. It seems that I’m the oddball here but I definitely was not impressed with the quality of dancers here. You have the gringo newbies working on what they learned in class, and the Colombians dancing to their own beat that may or may not resemble the actual beat of the music. I went on a Tuesday night when it was very crowded, cramped, and muggy. No real space to dance and no more tables left to put your stuff. Sorry but not my cup of tea. If you enjoy the crowded bar scene, listening to music w/some drinking & dancing on the side, sure it’s great. But imho I can’t see “real dancers” taking this place too seriously. Hey Jason, I still refer people to El Eslabon for the scene itself, though I tend to preface it with the fact that it’s a very small bar and gets crowded. 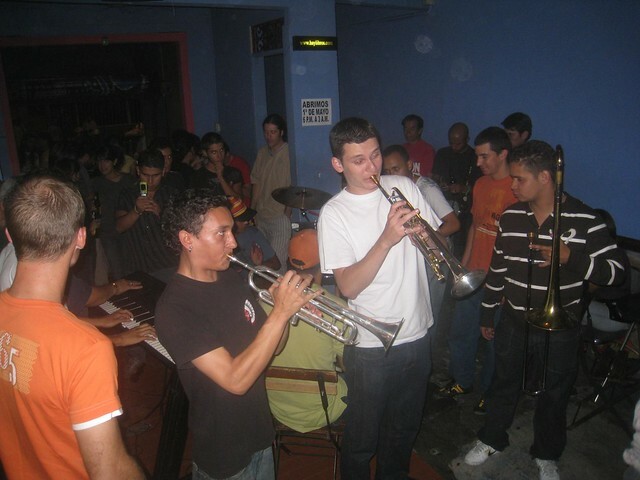 I enjoyed my nights there, some of the first nights out salsa dancing in Medellin, but I quickly found it was too small to feel comfortable going on a regular basis. For the non-dancers, I think they’d get a hoot out of the general vibe and live music. Son Havana is one of my favorites for actually dancing, but it isn’t especially spacious once it fills up either.